This book elaborates a moral realism of phenomenological inspiration by introducing the idea that moral experience, primordially, constitutes a perceptual grasp of actions and of their solid traces in the world. The main thesis is that, before any reference to values or to criteria about good and evil—that is, before any reference to specific ethical outlooks—one should explain the very materiality of what necessarily constitutes the ‘moral world’. These claims are substantiated by means of a text- centered interpretation of Aristotle’s Nicomachean Ethics in dialogue with contemporary moral realism. The book concludes with a critique of Heidegger’s, Gadamer’s and Arendt’s approaches to Aristotle’s ethics. 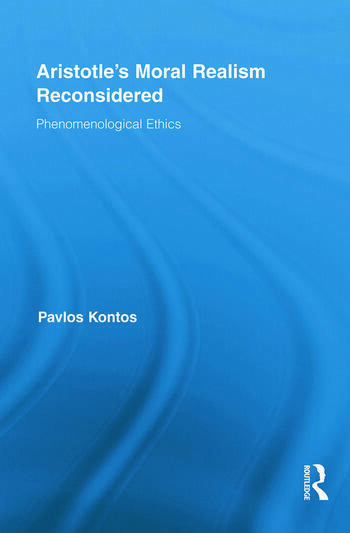 Pavlos Kontos is Associate Professor in the Department of Philosophy at Patras University, Greece. He is the author of L’action morale chez Aristote (Presses Universitaires de France, 2002) and D’une phénoménologie de la perception chez Heidegger (Kluwer, 1996) and co-editor of Kant: Making Reason Intuitive (Palgrave, 2006) and Gadamer et les Grecs (Vrin, 2005).